Anitra Albea, left, put spaghetti on a plate for Maria Siaris last night as Halau Na Mamo O Tulipo served a dinner to residents of the Kalaeloa transitional shelter Onelauena. A volunteer grabbed Tina Olds' wheelchair and pushed her through the food line, helping her fill her plate at Onelauena, the homeless shelter in Kalaeloa. "One meal I don't have to struggle for is a great meal," Olds said. As one of its several community events this year, Halau Na Mamo O Tulipa brought more than 30 members last night to serve a spaghetti dinner and dessert for residents of Onelauena. "You give back to the community, the community gives back to you," said Kumu Hula Leato Savini. "It was very good for them to come and give," Olds said. "I definitely have that blessed feeling today." Olds is one of 240 people living in the emergency/transitional shelter. In October the state completed nearly $2 million worth of renovations to the shelter and opened it to residents in keeping with the governor's plan to help the homeless people on the Waianae Coast. The three-story former military building has 69 living units and is currently at capacity with 65 families. More than half of the residents are under 18. Since the shelter opened four months ago, four families, two with six members, have moved into public or transitional housing, said Kanani Bulawan, executive director of Waianae Community Outreach, which operates the shelter. 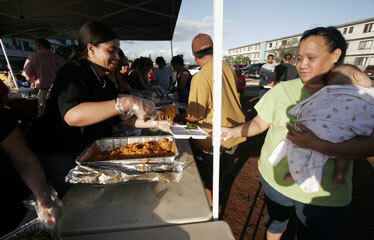 Maria Siaris, who lives at the shelter with her five children and husband, said the dinner was great for the children. "They're all happy," she said. Savini, the halau's 24-year-old founder, told the residents he is reciprocating because the community has given to his halau. Named after Savini's grandmother Tulipa, also a teacher of Polynesian dance, Halau Na Mamo O Tulipa means "descendants of Tulipa." Savini said he knows that just because the people have a place to stay does not mean they have a meal to eat. The event also provided a chance for halau members to mingle and meet each other, building a stronger bond between them. "It brings us closer together as a halau," said Corine Harada, who has two daughters in the halau. Jordan Miguel, 19, a halau member who hopes to be a police officer, enjoys interacting with the people he helps. He said he wanted them to know that "they still have people who care."